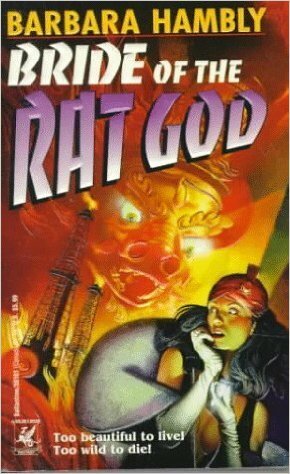 BRIDE OF THE RAT GOD is a marvelous historical novel (with an element of fantasy to it) that belies its kitschy title. The title makes the story, of course, because it is, in fact, about a silent film star who gets caught in a sorcerous web of complications involving a sacred Chinese heirloom, a jealous demon-god who wants her soul, and his attempted sacrifice of her on the altar of his own ancient desire. Sounds kind of melodramatic and silly, eh? Not so much. Barbara Hambly has a deft touch with deep and well articulated characters, and she adds layers of experience and reality to her characters as she goes. The marvelously well written landscape of 1920s Hollywood is also meticulously researched and is perfectly portrayed, with an eye to both technical and emotional detail that is all too often lacking in historical novels. The fantastical / supernatural elements of the novel merely add a rapidly accelerating plot to a novel that’s already a strong and well-written story of two women whose lives have become enmeshed in the silliness and wild party that is Hollywood (circa 1920s…. probably worse now). I’ll be reading more Hambly, because she made me believe in her characters, their desperate situation and their history. I’ve also written quite a bit about Bride of the Rat God in my How to Write Fantasy Series, which you can read here. My only nit to pick was that the final confrontation was not powerful enough — it didn’t knock my socks off. But I really cared about the characters, and I really believed in the story, which is enough to out-last any slowness to the final denouement.